Why are Colt Cowls the number 1 chimney cowl brand? As the oldest and best known chimney cowl supplier in the UK we want to be sure that all our products meet our own high standards of production quality and that those standards meet the expectations of our customers. Millions of Colt Cowl products installed decades prior are still functioning on dwellings throughout the UK testiment to the old adage that there is nothing better than the test of time! How long have we been making Colt Cowls? Colt Cowls has been manufacturing chimney cowls since 1931 and during that time many millions of Colt Cowls have been sold and installed. This has given the company an unique insight into the very best ways to manufacture cowls and today we have as a result the highest quality products available on the market. All Colt Cowls are manufactured in one single factory that fully understands the critical nature of quality. This is because the factory is certified and regularly audited against the rigorous and exacting requirements set down under the internationally recognised standard ISO 9001:2015 Quality Management Systems. Requirements. Surprisingly “ISO” does not stand for “International Standards Organisation” but derives from the Greek word “isos” meaning “equal”. Founded in 1947 ISO is an international, independent, non-governmental organisation based in Geneva, Switzerland. The ISO 9001:2015 (a 30 page document) takes time and effort to implement and, most importantly, to maintain. In fact it is the maintenance of these conditions which must be reviewed, audited and certified on a regular basis by an independent inspection agency such as BSI. Because the Colt Cowls factory has been certified and audited to ISO 9001:2015 you can be sure that the product you have purchased is of the highest quality. What testing has been carried out on our products? The best test of all is that a product has stood the test of time. No simulated weathering or performance test can adequately represent real time exposure and Colt Cowls products have been installed on millions of chimneys from John O‘Groats to Land’s End since 1931. Our products have also of course been tested to all relevant standards including the new BSEN 16475-7:2016 and BS EN 1856 and BS 715 and certification is available in support of this. What performance can you expect from the materials we use? All the materials that we use have performed in a full range of weather and flue conditions in the UK and in many countries in other parts of Europe for many many years so that we are confident that the types of aluminium and stainless steel used in the vast majority of our products not only meet the requirements of any relevant BS or BS EN standards as referred to above, but more importantly have stood the test of time. What method of installing a cowl do we employ? The methods of fixing Colt Cowls to chimneys have been in use for as long as we have been making cowls. Until the late 1990s all of our cowls used an internal “hook” bolt method whereby the hook shaped bolts attached to the base of the cowl drop down inside the rim of the chimney pot and are tightened. Since that time a different and less costly method using tabs, attached to the base of the cowl drop down outside the chimney pot and are tightened against the sides of the pot with a jubilee band. Both these methods employ stainless steel parts and are equally effective when installed correctly. Millions of installations cannot be wrong! What packaging do we use? To protect and maintain the quality of the products to your doorstep all Colt Cowls are carefully packaged in the factory in a range of materials. Many are supplied in merchandised packaging for display in store. 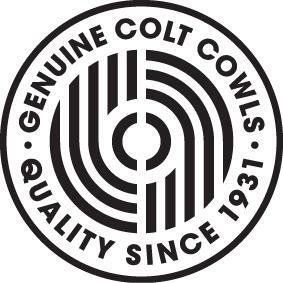 What distinguishes a Colt Cowl from one of its competitors? Because we want our customers to have the confidence and assurance that Colt Cowls are the best quality available in the market, every Colt Cowl is marked with a quality label.